Top reasons why vendors/manufacturers fail to deploy adequate content for partner enablement. As technology continues to accelerate productivity in the channel industry, the need for clear and concise, meticulously detailed content or partner enablement becomes ever more important. But as studies have shown, manufacturers/vendors suffer from inadequate content production for their channel partners—slowing down not only productivity but also a partner (incentive) participation, communication, and quality. 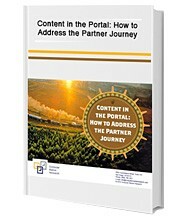 Receive a Free whitepaper on “Content in the Portal: How to Address the Partner Journey” by filling out the form on the right.